Clams come in a variety of shapes and sizes. Clams do not require a lot of preparation or cooking time, and they can be either frozen or refrigerated. Fresh clams need to be consumed or prepared within three days of purchase. Once you purchase clams, clean them carefully and keep them alive before you cook them. After you cook the clams, store them with their juices in either the refrigerator or freezer in an airtight container. Inspect each clam to see if the clams are fresh. Tap on the shells, and if the clam shells do not close, discard them. 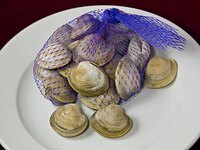 Remove the clams from the bag to let them breathe. Keep them alive by placing them in a colander. Place the colander on top of a bowl to let the water drain from the clams. Do not soak them in fresh water or put them in ice because this will kill them. Soak paper towels in water. Remove the excess water from the paper towels until they do not drip. Drape the paper towels over the colander. Place the colander and bowl in the refrigerator. Do not place them in an area of the refrigerator that ices over. You may need to turn up the temperature to prevent the clams from freezing. Store the clams in the refrigerator for up to three days. Place the clams in an airtight container or freezer bag. Pour the broth over the clams to keep them from becoming dry. Store them in the freezer for up to three months for best results. Store them in the refrigerator for three days. Mark the container or freezer bag with a date. This will ensure that you consume them before they start to lose their flavor. Thaw the clams in the refrigerator when you are ready to eat them.